From the founding of EDRC through 2002 the organisation played a leading role in the global NGO activities in preparation for and follow-up to the UN Conference on Environment and Development (UNCED) in 1992 and the World Summit on Sustainable Development (WSSD) in 2002. Already in 1984-85, EDRC’s co-founder, Ronald A. Kingham (then Programme Officer, International Coalition for Development Action – ICDA) was seconded to the Environment Liaison Centre - ELC, Nairobi as Researcher, Conference Co-organiser and Rapporteur for the Global Meeting on Environment and Development for NGOs, Nairobi, 1985, after which he edited the Global Action Guide: A Handbook for NGO Co-operation on Environment and Development, ELCI, Nairobi, 1987, 166 pp. Kingham, R. and Venning, M., Study on Integrating Environmental Aspects in European Development Assistance, EDRC, Brussels, 1988. 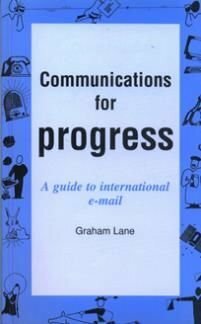 Lane, G., Communications for Progress: A Guide to International E-mail, Antenna, CIIR, EDRC, Interdoc, London, 1990, 154 pp. Kingham, R. and Mullaart, J., “Op Weg naar een Samenhangende Ecologische Benadering: De Betrekkingen tussen de EG en de Derde Wereld” in Europa Periodiek: De Europeses Gemeenschap en de Ontwikkelingslanden, Europese Beweging in Nederland, Jaargang 7, Nummer 1, February 1990, pp. 15-17. 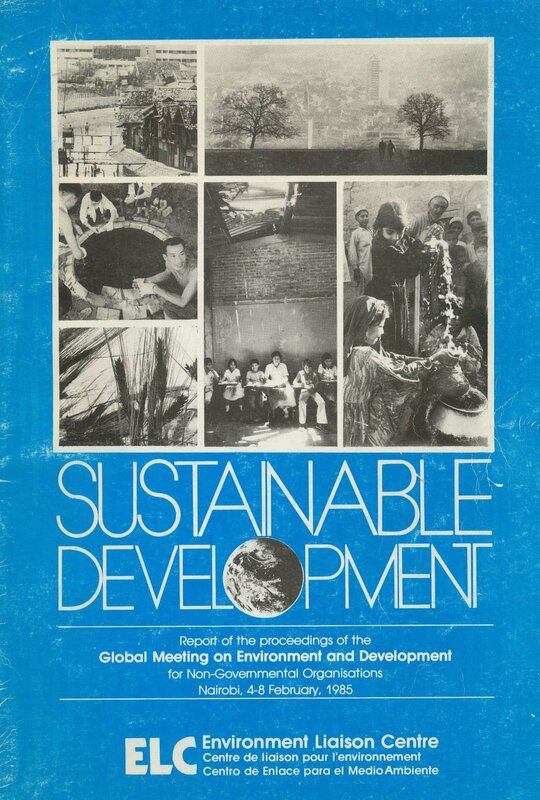 Our work related to the United Nations Conference on Environment and Development (UNCED) began in earnest in 1990 when EDRC co-founded and chaired the first Coordinating Committee meetings of the Alliance of Northern People for Environment and Development – ANPED (1990-1991). EDRC’s Programme Coordinator, Jeannette Mullaart, co-organised the ANPED East European Working Group helping to secure funding to enable the involvement of Central and Eastern European NGOs in the UNCED process and input into the “Agenda Ya Wananchi , Citizen’s Action Plan for the 1990’s”, adopted at the 1991 Paris global NGO Conference. 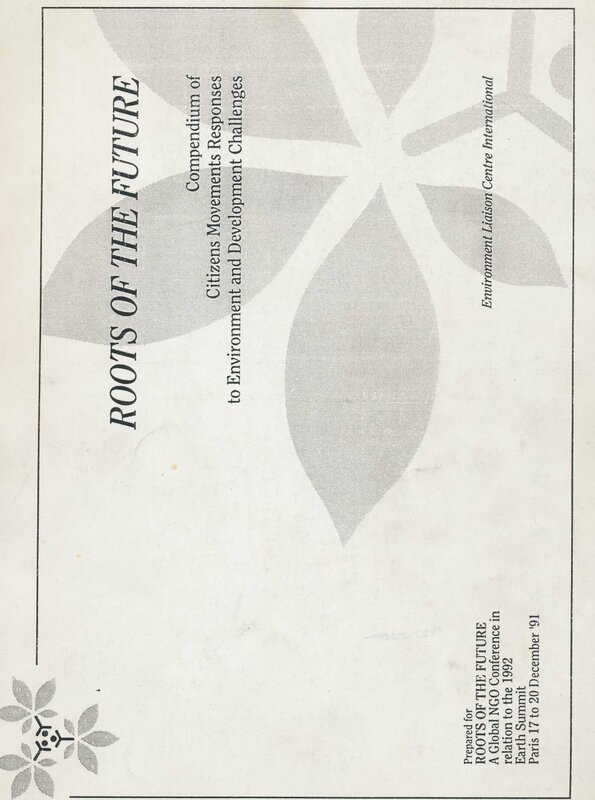 Roots of the Future: Compendium of Citizen's Movements Responses to Environment and Development Challenges, EDRC / ELCI, Brussels / Nairobi, November 1991, 640 pp. 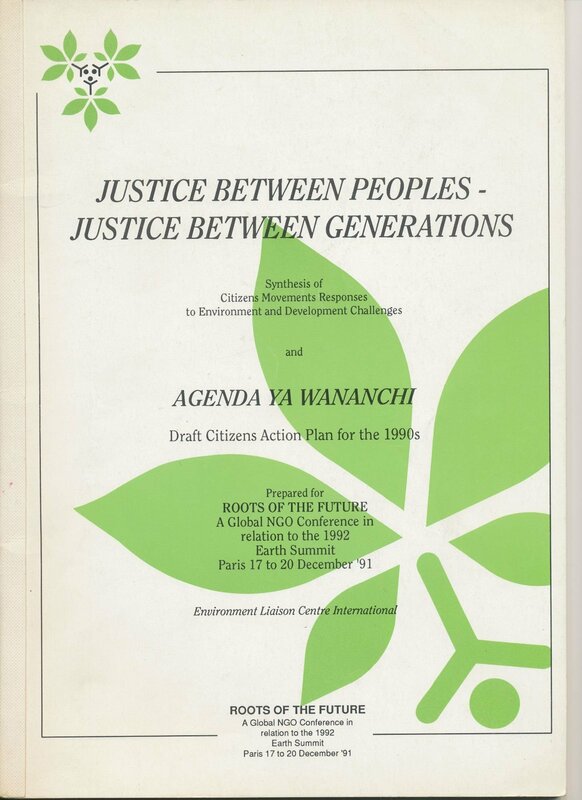 Justice Between Peoples, Justice Between Generations: Background document for Roots of the Future: A Global NGO Conference in relation to the 1992 Earth Summit, (Paris, 17-20 December 1991), for ELCI, Paris / Nairobi, December 1991, 44p. 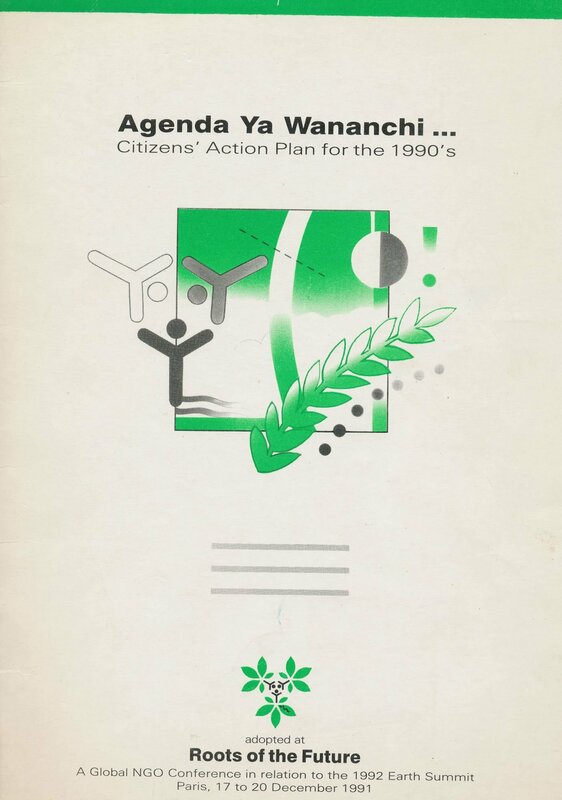 Agenda Ya Wananchi: Citizens' Action Plan for the 1990s, Adopted at Roots of the Future: A Global NGO Conference in relation to the 1992 Earth Summit, (Paris, 17-20 December 1991), for ELCI, Nairobi, February 1992, 36 pp. 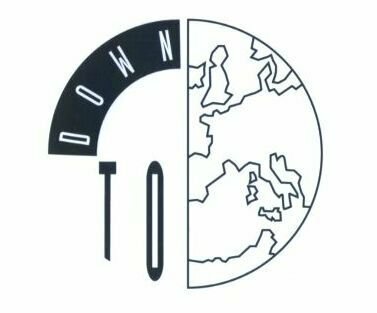 In follow-up to the 1992 Earth Summit, EDRC organised Between the Summits: Down to Earth: Inter-regional Meeting on Common Action for Sustainable Development, co-organised with the Danish UNA and the North-South Centre of the Council of Europe, at the Danish Parliament, Copenhagen, December 1993. 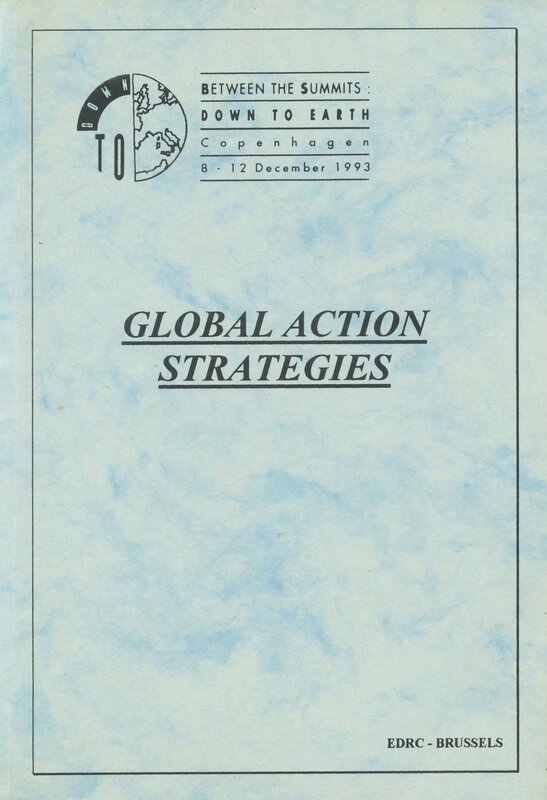 This resulted in the publication of the Global Action Strategies: A Collection of the Strategies developed by the Down to Earth Process, EDRC, Brussels, 1994 (English/French). 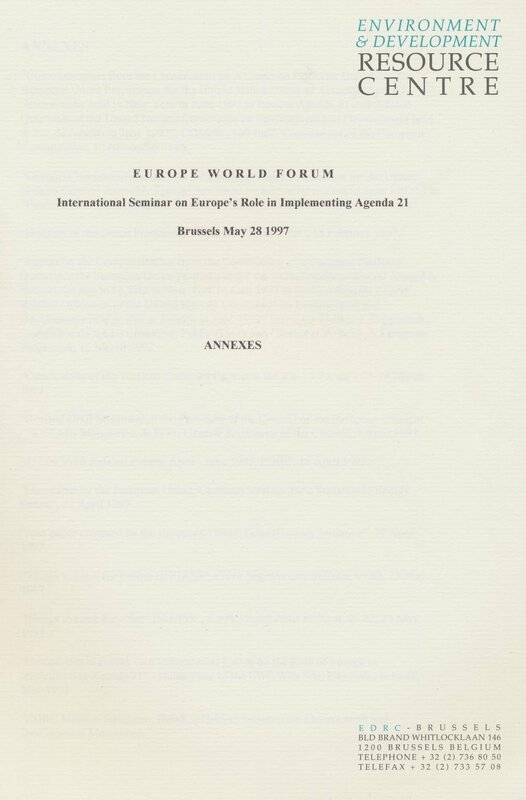 We also organised the Europe-World Forum: International Seminar (and website) on Europe's Role in Implementing Agenda 21 at the European Commission, May 1997. 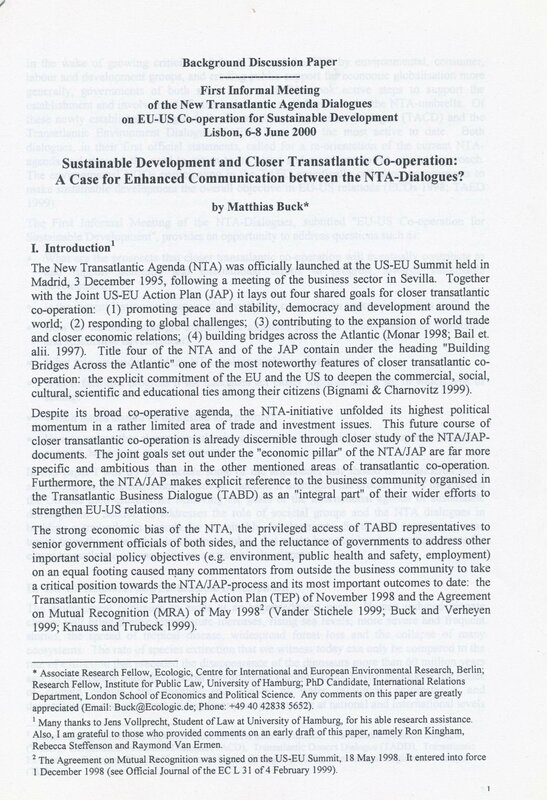 EDRC’s Director also served as Special Projects Co-ordinator for Counterpart Europe / Counterpart International in 1999 2001 assisting in the organisation of Contraction & Convergence: From Idea to Deal at the COP6 Climate Conference, The Hague, November 1999. 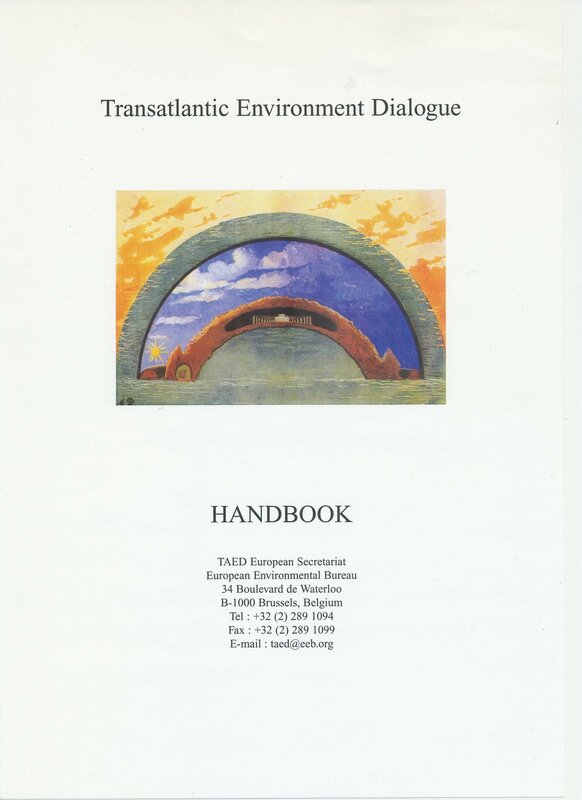 EDRC’s Director served as the European Co-ordinator for the Transatlantic Environment Dialogue - TAED, playing a leading role in the establishment and development of the network and organiser of the 1st and 3rd Meetings of the TAED, at the European Environment Bureau, Brussels, 1999-2000. 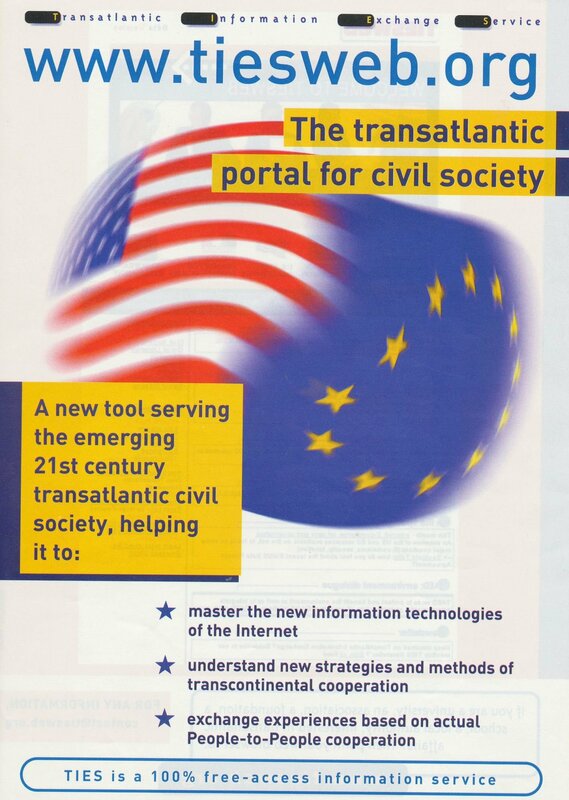 He was also Head, Environment Section, Transatlantic Information Exchange Service - TIES, (1999-2000). 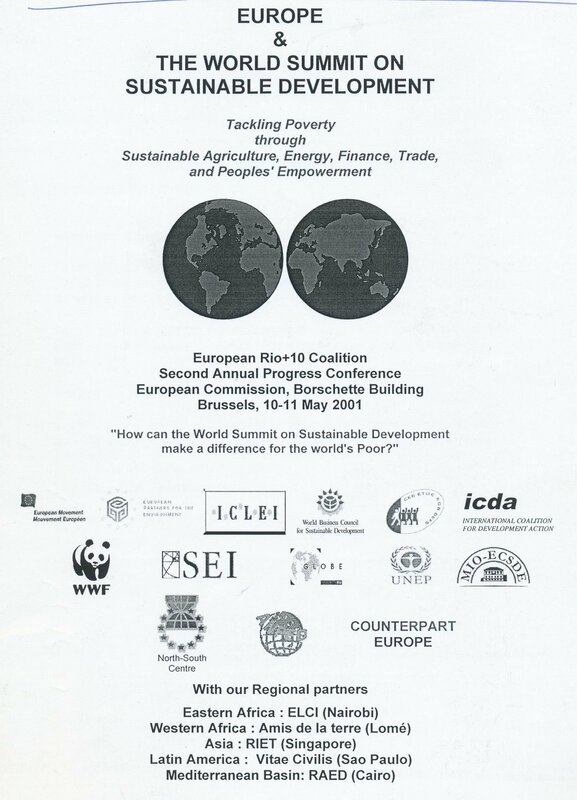 During 2000-2001 EDRC helped European Partners for the Environment (EPE) to establish and co-ordinate the European Rio+10 Coalition and its "Europe in the World" Contact Group preparing for Europe's role in the World Summit on Sustainable Development (WSSD) in 2002. EDRC also assisted in the organisation of the 1st and 2nd European Rio+10 Conferences in Brussels in June 2000 and May 2001. 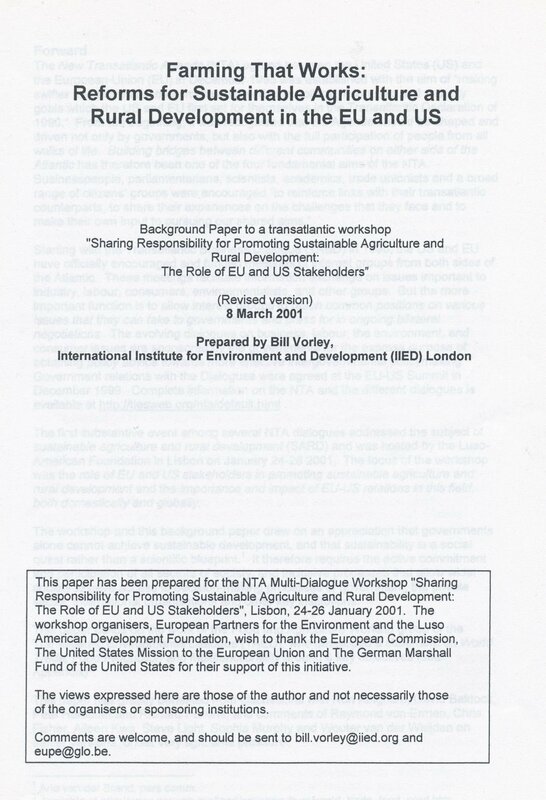 We also coordinated for EPE the New Transatlantic Dialogue Project, a mutli-stakeholder transatlantic network including the organisation of the first Informal Meeting of the New Transatlantic Agenda Dialogues on EU-US Co-operation for Sustainable Development, Lisbon, June 2000 and the NTA Multi-Dialogue Workshop on Sustainable Agriculture and Rural Development, Lisbon, January 2001. 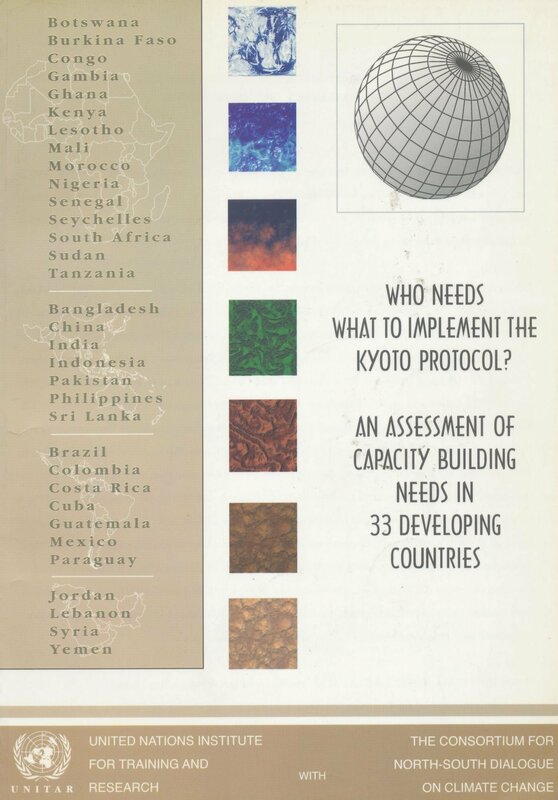 In 2001, EDRC assisted for the United Nations Institute for Training and Research (UNITAR) and the Consortium for North-South Dialogue on Climate Change in the development and implementation of a survey and data system for the study: Who Needs What to Implement the Kyoto Protocol? An Assessment of Capacity Building Needs in 33 Developing Countries, UNITAR, Geneva October 2001, 148 pp. 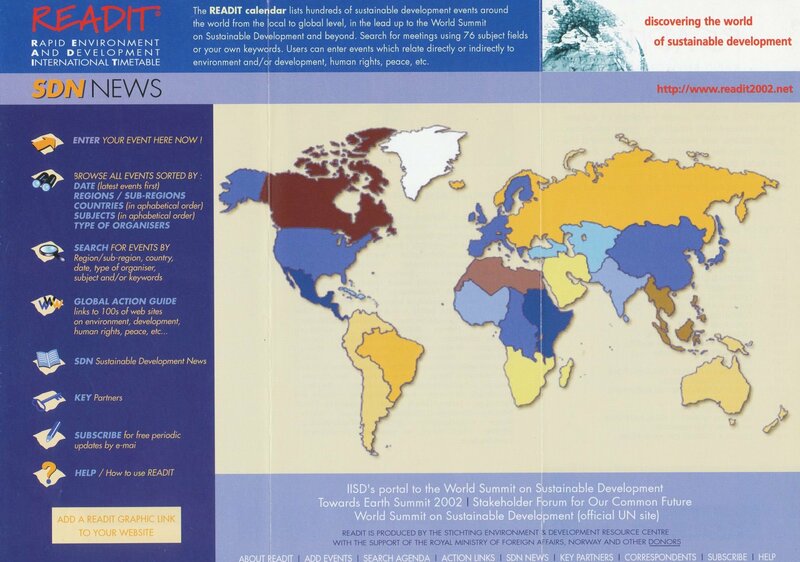 In preparation for the World Summit on Sustainable Development (WSSD) in 2002 EDRC launched the Rapid Environment And Development International Timetable (READIT) –an online interactive data base of sustainable development events and organisations. 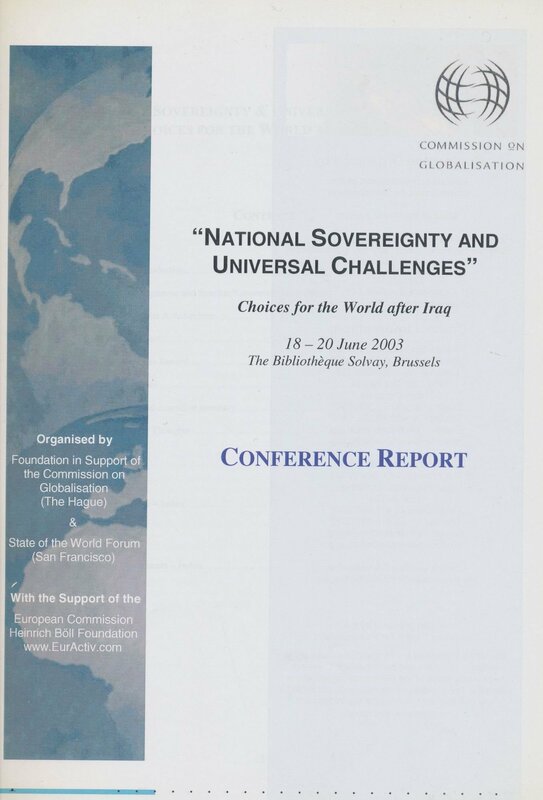 EDRC co-organised with the Commission on Globalisation / State of the World Forum the COG International Conference on National Sovereignty and Universal Challenges: Choices for the World after Iraq, Brussels, 18-20 June 2003. Also that year Ronald A. Kingham authored INSPIRE: Infrastructure for Spatial Information in Europe: Consultation Paper on a Forthcoming EU Legal Initiative on Spatial Information for Community Policy-making and Implementation, European Commission – DG Environment, 2003, 37 pp. EDRC also assisted the University for Peace with the organisation of the Climate Change and Vulnerability Conference at the Peace Palace in The Hague, 2007.